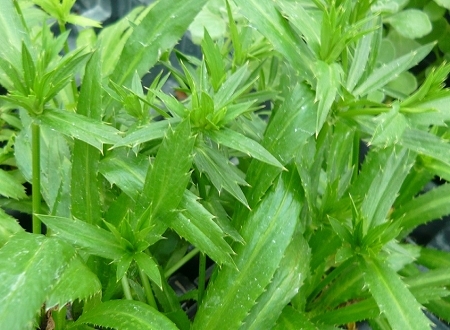 Culantro (Eryngium foetidum) (Also called Mexican Coriander or Thorny Coriander)- Warm weather cilantro substitute. Leathery green and thorny leaves have a flavor very similar to cilantro. Chopped leaves hold up well during cooking and retain their flavor and color well when dried or frozen. Thrives in warm weather when normal cilantro is difficult to grow. Perennial zones 8-11+ Live starter plant in 3 inch container. I am impressed with this plant. To me it has a soft Cilantro taste and smell that I think I will like more than cilantro proper. And if it indeed grows longer without bolting like cilantro, that would be awesome. I buy herbs from many Nursery's Colonial Creek is the best ever. Every herb arrived in perfect shape well established and very healthy and a great size ready to transplant and take off growing. Love these people, plants obviously were grown and cared for with a lot of TLC. I normally would not take the time to comment on every plant purchased but this Nursery deserves it. And the price is a true bargain for the quality. I Highly recommend this grower.